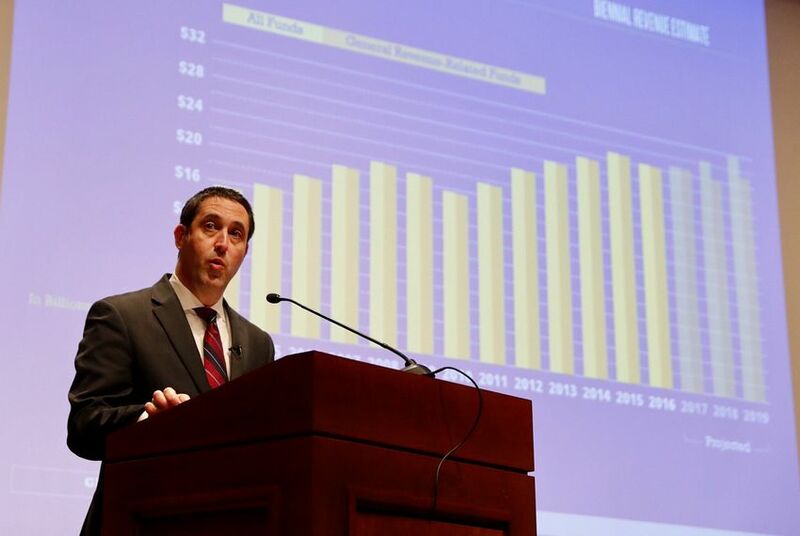 Facing sluggish economic forecasts, Comptroller Glenn Hegar announced Monday that lawmakers will have $104.87 billion in state funds at their disposal in crafting the next two-year budget, a 2.7 percent decrease from the last session two years ago. Facing sluggish economic forecasts amid low oil prices along with billions in tax revenue already dedicated to the state highway fund, Comptroller Glenn Hegar announced Monday that lawmakers will have $104.87 billion in state funds at their disposal in crafting the next two-year budget, a 2.7 percent decrease from his estimate ahead of the legislative session two years ago. Hegar told state lawmakers he expected a "slow to moderate" expansion of the Texas economy. Still, he said, the amount of revenue they will be able to negotiate over has fallen. That's largely because lawmakers in 2015 moved to dedicate up to $5 billion in sales tax revenue every two years to the state's highway fund, rather than making it available to spend on other priorities such as schools, health care or reforms to the embattled Texas foster care system. "We are projecting overall revenue growth," Hegar said. "Such growth, however, is more than offset" by the demands of the state highway fund and other dedicated funds. Two years ago, Hegar estimated that the Legislature would have $113 billion in state funds, also known as general revenue. Adding in federal funds and other revenue sources, lawmakers would have $221 billion in total for its budget, as well as $11.1 billion in the state's Rainy Day Fund, he said at the time. Lawmakers ultimately passed a $209.4 billion budget, which included billions in tax cuts. On Monday, Hegar estimated lawmakers would have $104.87 billion in general revenue and $224.8 billion in total revenue to write a budget for the 2018-19 biennium, which begins in September. The state's Rainy Day Fund, fed largely by taxes on oil and gas development, will have a balance of $11.9 billion at the end of the next two-year budget, assuming legislators don't tap that savings account during the session that begins Tuesday, Hegar said. “There are obviously going to be cuts to the budget. We’re just going to have to figure out where those cuts are going to come,” said state Rep. Drew Darby, R-San Angelo, one of the House’s experts on the budget. He said that the amount of general revenue available to lawmakers is $5 billion to $6 billion less than what it would take to cover current services when inflation and the growth of the state are taken into account. It would take about $109 billion in general revenue to cover the cost of current programs and services provided by the state, a little more than $4 billion more than Hegar estimated the state will have to spend, according to an estimate from the left-leaning Center for Public Policy Priorities. Gov. Greg Abbott said in a statement Monday that Texas would live within its means. Hegar's forecast for oil prices Monday was far less rosy than it was two years ago, when he based his estimate on the assumption that a barrel of West Texas crude would average between $65 and $75 over the 2016-17 biennium. At the time, oil was trading at around $46 a barrel. The averages since then have been well below $50 a barrel. On Monday, while a barrel of West Texas crude was trading at around $52, Hegar's office said his latest forecast assumed oil would trade at $55.11 a barrel for the first year of the biennium and $59.26 for the second year. Hegar has also tempered his views on the state's future economic growth. Two years ago, Hegar and his analysts predicted that real gross state product would grow 3.2 percent in the 2016 fiscal year and 4.1 percent in 2017. In the new estimate released Monday, his office noted that 2016 turned out much worse, with just 0.2 percent growth. He is now predicting growth of just 2.5 percent in the current fiscal year, which ends in August. Looking forward even further, Hegar forecasted real gross state product growing 3 percent and 3.1 percent, respectively, in the 2018 and 2019 fiscal years. State Sen.-elect Dawn Buckingham, R-Austin, said Monday that lawmakers were bracing for an unfavorable revenue estimate. "I don't think it's any big surprise that we're going to have a tighter budget this session than last session," she said. Still, she did not think lawmakers would need to take any money out of the state's Rainy Day Fund. "Hopefully we'll still be able to carve out some tax relief for our folks." Democrats were less optimistic. State Rep. Eddie Rodriguez, D-Austin, said budget cuts posed a risk of disproportionately hitting programs that benefit low-income and minority Texans. "It's already apparent, for better or worse, that this session will have massive impact on minority communities around the state," he said at a news conference. "The biennial revenue estimate released today is only one of the major challenges that we'll be facing beginning tomorrow." Before lawmakers face a vote on the next two-year budget, they will likely decide on a supplemental one designed to address immediate needs unaddressed in the budget lawmakers wrote two years earlier. Lawmakers usually pay for the supplemental budget by tapping funds left over in general revenue accounts. Two years ago, lawmakers started their session with $7.5 billion left over and put $300 million of that toward a $564.4 million supplemental budget (the rest of the money came from federal funds). This time, Hegar said lawmakers will have just $1.53 billion in starting cash and that their needs for a supplemental appropriation could be much greater. How state leaders deal with that mismatch between supplemental needs and cash on hand at the start of the session could provide a preview of how lawmakers will tackle even larger funding needs in the 2018-19 budget as the session wears on. Ross Ramsey, Patrick Svitek and Alexa Ura contributed to this report.